For Mosab Hassan Yousef, everything begins and ends with God. The startling journey of the eldest son of a Hamas leader, a Christian convert, and former Israeli spy, has shocked, angered, and intrigued. 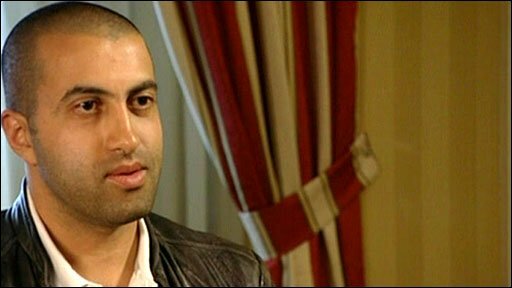 We meet in New York on the day his new book, Son of Hamas, is published in the country he fled to a few years ago. Before we start our interview, a burly man in his entourage asks his own question. I take him for a bodyguard, possibly an Israeli. "Could we say our prayers first?" he asks our BBC team. And then, they bow their heads in Christian prayer asking for God's blessing. Mosab Hassan Yousef repeatedly makes it clear in our wide-ranging interview that he now sees himself walking in the path of Jesus Christ, whom devout Christians regard as the son of God. He says he is also suffering for his beliefs, "carrying the cross," as Jesus did, as told in the Bible. The man whose Israeli code name became the Green Prince admits how he has gone from being "a prince in my country to the lowest possible level, of being a traitor". But he is still a man on a mission: "I want my people to understand I am not doing what they want, but what they need." His book tells the story of a young man raised in a strict Muslim family in the Israeli-occupied West Bank, in the folds of the Hamas movement. But he lands in an Israeli prison before he is 20, experiences Israeli torture, but also witnesses torture by Hamas inmates against other Palestinians. A young Palestinian's rage against Israeli occupation is soon matched by growing hatred of what he sees as the corruption of the Palestinian Authority, the violent ideology of Hamas and finally the precepts of his own Islamic faith. His mood is still surprisingly upbeat. "I am more optimistic than at any time in the past, and hopeful about the future. I am sure I will help my people as I helped them in the past, even though they didn't appreciate it." But he expressed hope that one day they would, even if it was not in his own lifetime. Appearing relaxed, and dressed casually in jeans and an open-necked shirt, 32-year-old Mosab said he wrote this book because what he did had "opened a thousand questions in everybody's mind". He makes the bold assertion that in a decade of spying for the Israeli intelligence agency Shin Bet, he served his own agenda, not theirs. "This is a dangerous statement," he boasts, "but I say it with a lot of confidence." 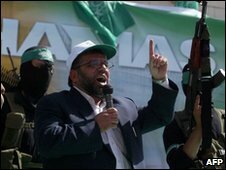 He describes his agenda as "stopping bloodshed" - disrupting Palestinian suicide bombings against Israelis, and Israel's assassination of Palestinian leaders, including his own father. He claims to have stopped then-Israeli Prime Minister Ariel Sharon from killing several key Hamas members, and said he saved the life of current President Shimon Peres. He said he had to do "the right thing". But this week his father, Sheikh Hassan Yousef, who is in an Israeli prison, disowned his son on behalf of the entire family. "This is really hard," Mosab admits. "On the eve of releasing a book, I should celebrate with family members." But he believes his problem is not with his father, who has clearly been the most important person in his life. "My problem is not with my father, but his God." For a convert who speaks so strongly against Islam, and what he sees as its support for acts like suicide bombings, he shows no fear aside from the presence of his bodyguards. you can find out where I live on Facebook," he says, referring to his page on the social media site. He and his aides make a point of letting us know his book will soon be published in Arabic. Most copies will be free. Mosab says neither Shin Bet nor Hamas tried to prevent his story from being published. But he flashes a smile as he reflects on the irony that both organisations shared the same interest in stopping it. Barely suppressing a wide grin, he says he has more secrets to reveal but will not do it now, lest he harm operations that may be underway. For now, he says he is spending time "building many bridges". But he admits he has also burnt some old ones. The interview over, he is still thinking about his God. He looks me in the eye and says "I think you are a Christian".